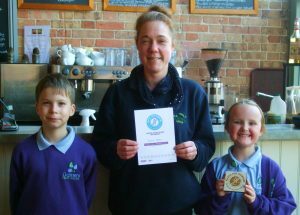 Damers First School’s Eco Crew has been working with Dorchester Town Council, Dorchester BID and Litter Free Dorset to achieve Surfers Against Sewage (SAS) Plastic Free Community Status in Dorchester, and we’re delighted to have had our green credentials recognised as part of the campaign. Earlier this month, The Engine Room received an SAS Business Champion Plaque for our commitment to reducing single use plastic and replacing it with sustainable alternatives, such as biodegradable cups, wooden cutlery and paper straws for takeaways. It is so refreshing to see the next generation taking the future of their planet into their own hands, encouraging and inspiring businesses to think about their impact on the environment. We wish them the best of luck in helping Dorchester Town Council achieve plastic free status by the summer.